Veronica has been dancing tango since 2000 and actively teaching and performing since 2007. She lives in Paris and is one of the founders and teachers of Tango Mon Amour. She teaches in Paris and travels regularly to others cities of France, as well as elsewhere in Western and Eastern Europe, Russia and Canada. Veronica has Russian origins, but started dancing tango while living in The Netherlands. Her experience in modern dance and classical ballet allowed her to build a solid technique, further enriched by her experience with various bodywork techniques. She has worked with different partners, performing and teaching in France, Sweden, Norway, UK, Italy, The Netherlands, Cyprus, Greece, Germany, Czech Republic, Russia, Ukraine, Belarus, Canada and the USA. Veronica is an elegant dancer with a strong personality and a refined sense of music. In her teaching she emphasizes musicality, connection in the couple and the quality of movement. She is also a popular tango blogger, often invited to give conferences about the topics she touches upon in her writing. Her essays on tango are translated into 18 languages and shared by tango people all over the world. Veronica first came to Montreal – and to MonTango – in the spring of 2017. She returns in 2019 as the featured guest dancer at Tanguerafest, from March 13 to 17. Veronica will teach women's technique workshops, several pre-milonga classes for everyone, will perform with MonTango's Jean-Sébastien Viard at the Tanguerafest Ball on March 16 and will close the festival with a conference titled Lady in Red: Being a woman in Argentine Tango. Click here for the full Tanguerafest schedule. Veronica will arrive in Montreal on March 9 and will be available for private lessons until March 18. Contact us for more information. A collection of nineteen essays is available in a book called ​WHY TANGO, which can be purchased on Amazon. Guest teachers Sandra Naccache and Jorge López split their time between Montreal, Buenos Aires and international tours. Since 2017, they teach regularly at MonTango during their stays in Montreal. Montango is proud to host these two high-calibre dancers. Sandra and Jorge perform and teach around the world in milongas, festivals and special events. They have worked in several dance companies and have appeared in movies and on TV as guest teachers and choreographers. Sandra and Jorge are known in Montreal for the quality of their dancing and teaching. The couple, charismatic, unique and efficient, have a wealth of knowledge and experience and take great joy and pride in sharing their passion. "Our mission is delivering to our students the authentic essence of tango. A complete dancer must develop strong body mechanics and awareness, coordination, technique and core strength in order to feel free to move and find harmony in the couple. With technique comes artistry and from a comprehensive understanding of movement, students can create. To help achieve that, we offer organized structured lesson plans, detailed analysis and breakdown of each pattern and movement, which allows our students to feel instant results, from beginners to advanced." Sandra and Jorge will perform in our show Una Historia de Tango in April 2019, and will teach several classes at MonTango in June. Schedule coming soon! Pamela Ramos Aracena and Theddy Lizama, from Chile, have each been dancing for 14 years, having begun their training separately. Pamela, metropolitan champion in both stage and salón tango in 2011, began doing European tours in 2010, dancing in festivals in Lyon, Lille, Montpellier and Paris, France; in San Remo, Venice, Rome and Genoa in Italy and Kehl and Strasburg, Germany. Theddy was both Latin American tango champion and metropolitan champion in salón tango in 2010. In 2006 he joined the "Proyectango" company, with whom he performed in the best theatres in Chile. 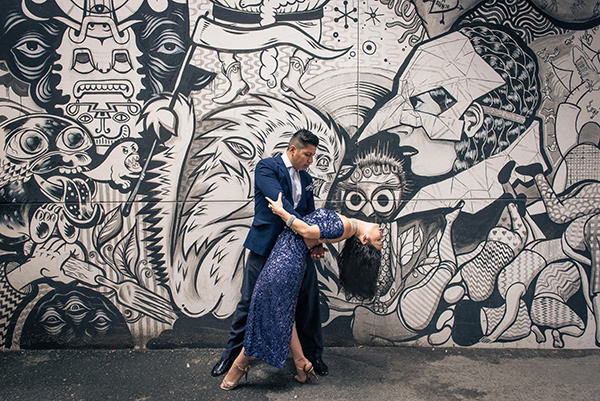 Pamela and Theddy have been dancing together since 2013, fusing the salón, milonguero and escenario styles. Together the couple spent six months teaching at the Contratango school in Bari, Italy, and they also worked in France and Yugoslavia. In 2013 they organized the "Campeonato Nacional de Milonga" in Chile. In 2016 they were invited to Montreal to participate in the Montreal International Tango Festival. They returned the following year for the show "Te Amo Tango" at Place des Arts and to participate once more in the festival. Their stay in North America also took them to New York and Pittsburgh. MonTango invited Pamela et Theddy to teach some classes in fall 2017 and, seeing the couple's impressive talent and generosity as teachers, welcomed them back for more classes and performances in 2018. From Brazil, Juliana considers Buenos Aires her second home after having studied tango there for 10 years, with both contemporary and old-school "maestros." She has participated in many festivals in Argentina and Brazil in recent years, and she recently toured Europe and Asia, working with such partners as Maximiliano Cristiani and Pablo Rodriguez. A few years ago, Juliana worked with Enrique de Fazio, one of the Hermanos Macana, at the IXth Congreso de Cultura Latina in Brazil. Known for her ornaments and a specialist in women's technique workshops, Juliana has recently delved into show tango, though she still believes the milonga is where the real tango lives. Juliana is organizer of the Mucho Tango Milonga in São Paulo, Brazil. Juliana was so popular as our guest dancer at Tanguerafest 2016 that we invited her back in 2017 and 2018.